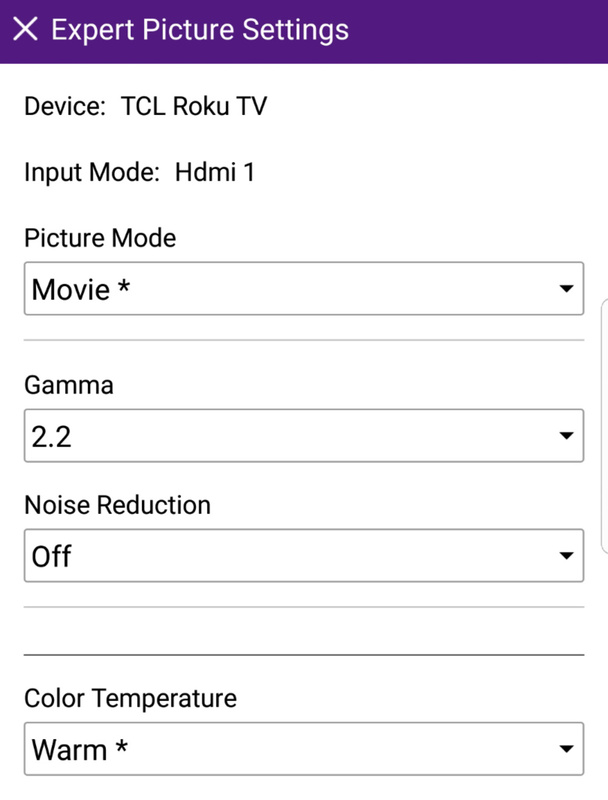 These are the settings we used to calibrate the 55" TCL C807 (55C807), and we expect them to be also good for the 65" version (65C807) and the 75" version (75C807) of the C Series. These setting are good for most content, from TV shows to movies and gaming. For gaming, some minor changes are needed to have the best input lag, and they are listed below. In the 'Options' menu, for our calibration process, we used the 'Movie' picture mode to get as close as possible to our calibration goal. 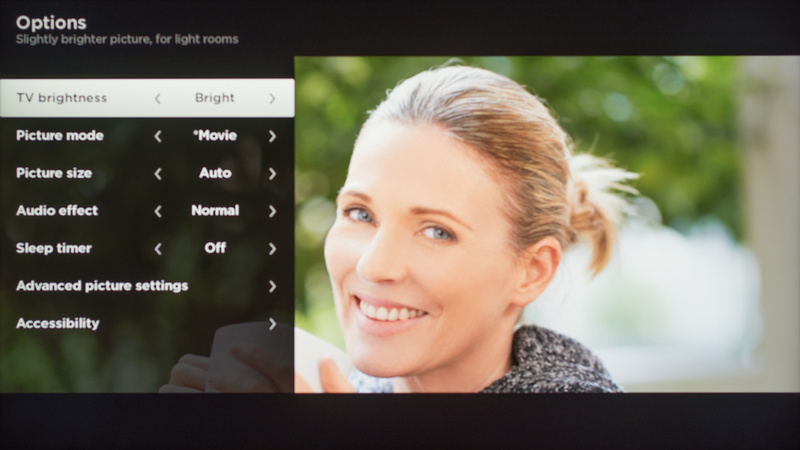 The 'TV brightness' was set to 'Bright' for our totally dark room, but you can set it to a brighter setting if you have a room with more light. The 'Picture Size' was left to 'Auto' since under this setting, the TV will adjust the picture size to match the screen size by itself. In the 'Advanced picture settings', we set the 'Dynamic contrast' 'Off' for the calibration process and because we always turn off image processing so that the video look as true to what the content creator intended. 'Dynamic contrast' can be useful if you find the image too dark in dark scene and you are loosing some detail as it can help bring some detail out. The 'Backlight' was set to 18 for our completely dark room, but here again, you should set it to match your room lighting. Note that here the 'backlight' works in combination with the 'TV brightness' option, giving you a more granular control of the TV luminance. 'Brightness' was left to 50 and the 'Contrast' to 100. The 'Sharpness' was set to 0 so that no oversharpness is added to the original content. 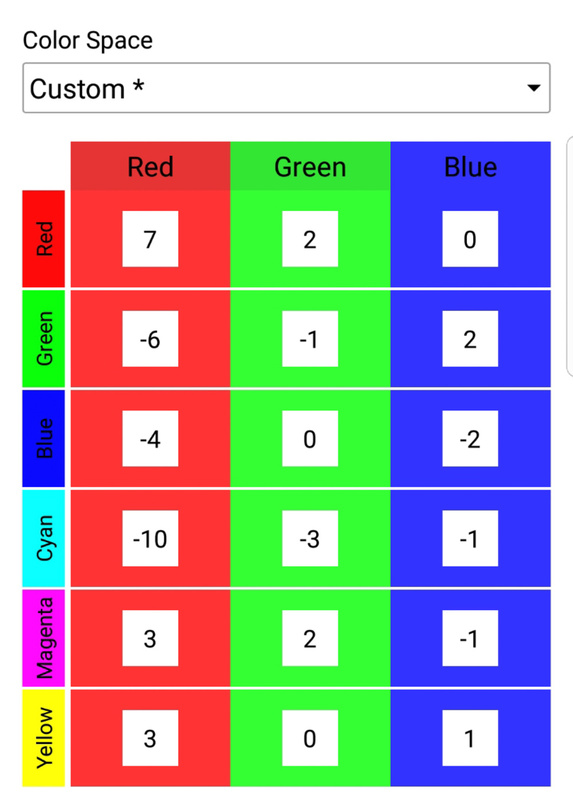 'Color' was left to 45 and 'Tint' to 0, their default values. The 'Color temperature' was set to 'Warm' since it is the color temperature the closest to our calibration goal, but you can set it to a colder temperature if you find the screen to be too yellow or reddish. 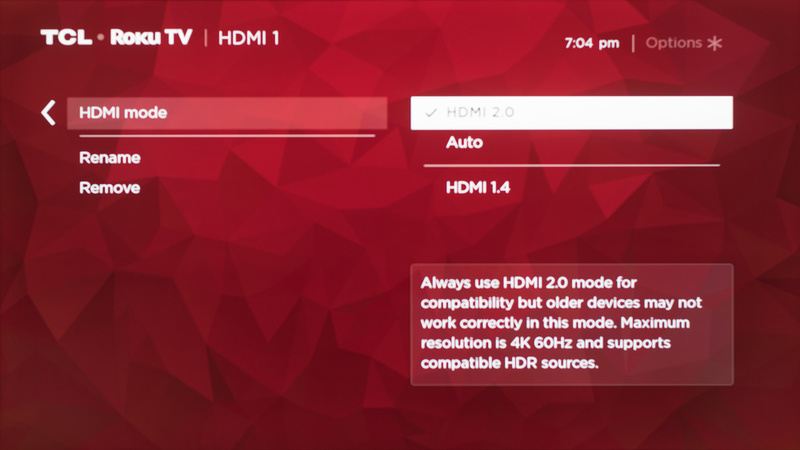 If you intend to watch HDR content via an HDR UHD Blu-ray player or via an HDR video game console connected via HDMI, you will have to set the 'HDMI mode' to 'HDMI 2.0' for the HDMI port in use. This option is situated in the 'TV inputs' menu. For HDR content, the TV will change picture mode to match the type of HDR content (Dolby Vision or HDR10) by itself, but if you want to be sure you have the best setting, just verify that the 'TV brightness' is set to the brighter setting (from the 'Options' menu), that the 'Backlight' is set to maximum. For playing video games in SDR or HDR, via video game console or PC, simply turn on 'Game mode' from the 'Advanced picture settings' to have the best input lag possible. There are some settings that are only available via the mobile Roku apps. The Roku app is compatible with iOS and Android devices and can be downloaded via either the Apple App Store or via Google Play Store. For more info on the Roku app itself, you can access this page. To access those setting, you need to go to the 'Setting' tab, and then go to 'Expert Picture Settings'. In the 'Expert Picture Settings' menu, you can set the 'Picture mode', 'Gamma', 'Noise Reduction', 'Color temperature', the '11 points White balance' calibration and the 'Color Space' calibration. Some settings like the picture mode and color temperature are redundant and don't need to be changed again if already set from the TV settings. For our calibration and to get the best picture quality, we set the 'Gamma' to 2.2. If you are watching SDR or HDR content and you find that you are losing too much detail in the dark area of the screen (black crunsh) or the white (clipping) you can change the 'Gamma' value to a lower or higher setting. We also set the 'Noise Reduction' to 'Off'. This can be turned on if you are watching some older low-resolution video since it can help to reduce compression artifacts often present on older content. If you intend to do a calibration, then you will need to change the value in the '11 Pt WB' (the white balance control) and change the 'Color Space' setting to 'Custom' and change the value for each color. Note that each color temperature has it separate calibration data, so if you calibrate on the 'Warm' color temperature, your correction won't be applied if you change the color temperature to another one.